Today is Day Three of my Spring Break. Already! I had thought about spending this week in Florida visiting family, but then plane tickets were so expensive, and there was so much to do here. So we decided on a long weekend in wine country followed by a “staycation” for myself while Drew went back to work. Now this is going to look like a very ordinary picture to many of you, and I confess that I almost felt silly sharing it. “Editor Voice” is saying, really? 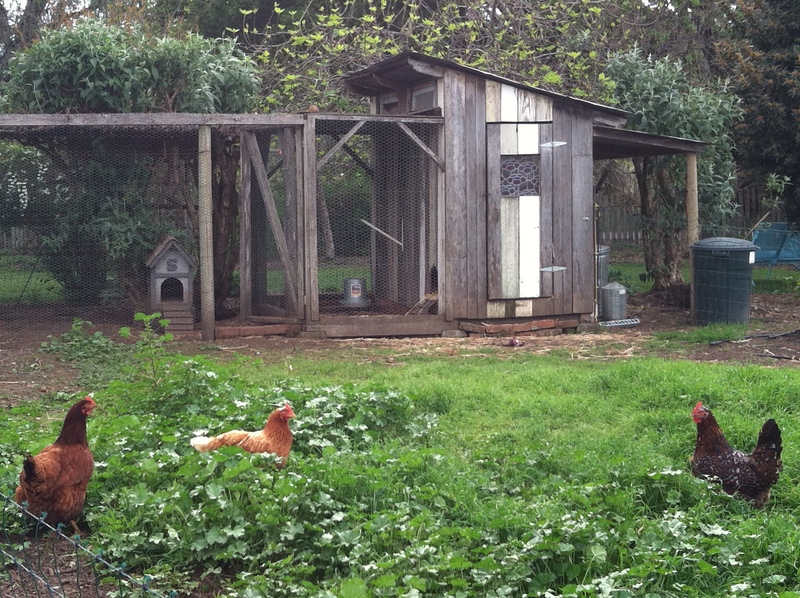 A picture of chickens — that is what you want to share from your amazing weekend getaway? But yes, this was one of my very favorite moments from the trip, because it summed up for me a vision, a little twinkling and twinge of a dream I have for my future, one day when I get tired of living my current dream of the big city life. That when I am a Real Grown-Up, I will go live on a little farm and have chickens and a garden and a dog and I won’t hear my neighbor’s TV at night while I am writing. That’s the thing about dreams — when you achieve them, they become reality. Then along with all the things that drew you to your dream, you realize all the things that make it real, and therefore imperfect. San Francisco was my dream, and I achieved it. I have been here almost six years now, and I still have those moments where I look around and think — wow, I actually live here! But then there are also the moments where I wonder if we could be just as happy — who knows, maybe even happier? — somewhere else, maybe living a completely different life. Taking the leap to move here took courage, somewhat careful planning, and faith in our family, friends, and in ourselves. One day in the maybe not-so-distant future, perhaps we will be ready to take another leap and start another adventure. Maybe one that involves chickens! In the meantime, I will continue to revel in my simple city garden bravely sprouting the occasional vegetable in amongst the weeds despite my haphazard gardening approach. There is an artichoke coming up right now, and some radishes, and maybe eventually some carrots. And there are always lots of happy city birds who are thankful for this little patch of green they call home, or at least a good place to hang out, rest, and hunt bugs for a while. This entry was posted in Uncategorized and tagged gardening, San Francisco Bay Area, weekends on April 3, 2013 by esimmeth. View | The Bay Lights. Just one more reason I love where I live! The Bay Bridge deserves a little love, after all — the Golden Gate is always stealing the show. When we first moved to San Francisco, it was the Bay Bridge that I could see from my balcony window. In the evenings, the setting sun would catch on the windows of houses across the Bay and it would look like the hills were on fire. I would stand out on my little balcony after a long day teaching and think about all the people looking out in my direction admiring the sunset, while I was catching a thousand tiny fireballs gleaming off each window. It only lasted for a moment each evening, and only happened at all on those certain evenings where we weren’t already socked in with fog. This man-made light show looks pretty cool, and I’ll definitely go check it out. But I bet it has nothing on that view from my old balcony. 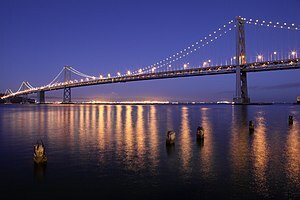 This entry was posted in Uncategorized and tagged art, Bay Bridge, Local, San Francisco, San Francisco Bay Area on March 5, 2013 by esimmeth.